Recruitment notices have been posted on several popular role-playing game sites. At this time I choose not to reveal those sites in hopes of avoiding connecting the dots for the unwanted eyes who are always watching. If you have been to one of those sites and decided to join the Agency, I thank you. The risk you take is greater than you know. The world owes you a debt. A debt that can never be repaid. A debt that, if you are successful, the world will never be aware of. That’s how we operate. Zero residual presence. Thank you for volunteering. Not that you knew you were volunteering. That’s also how we operate. Welcome to the Agency. My next endeavor is to add some useful tools for Deniable Asset through cards: Agent cards, support team cards, and gear cards. Looking at a deck with 12 themed cards for each type. 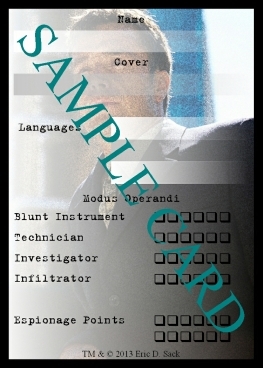 The cards will take the place of a character sheet and allow for physical placement on the table to allow for easy recognition of which element you agent is in, who is carrying which piece of gear, and which support team members and gear are out of the scenario for healing. Ready to be filled out by the player! The next question is… do we provide generic cards for the players to fill out… or pre-filled Agent cards, Gear cards, and Support Team cards… or both! Pre-Filled and ready to play! If you have an opinion, leave a comment!